A key principle of ColaLife is local determination of how the ColaLife opportunity is used in each location. I believe that this will be key to the sustainability of ColaLife. ColaLife must strengthen the existing public health infrastructure, not undermine it. This is a slide I use to explain this during the presentations I am giving at the moment. The ColaLife model can be split into three elements. At the core we have a distribution mechanism – AidPods in Coca-Cola crates – which would be replicable across the whole of Africa. 80% of all the Coca-Cola produced in Africa is sold from bottles and crates of this size. In July 2008 The Economist reported that Africans buy 36 billion bottles of Coke a year. That’s an average of more than 30 bottles per person! So this is a formidable distribution channel and an incredible offer if Coca-Cola were to support it. The plan is that this distribution mechanism would be offered across the whole of Africa to those with the long term responsibility, in each locality, for public health. This would normally be a range of partnerships between NGOs and the Government of the country. It would be up the Goverment/NGOs in each locality to decide whether they want to make use of this opportunity and if so, how to use it. 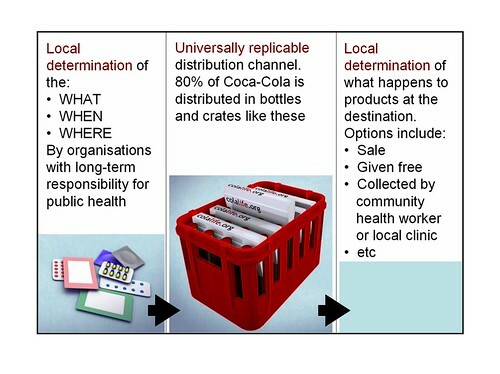 Coca-Cola would be likely to put certain conditions on the use of this channel eg maximum weight per AidPod; maximum number of AidPods per crate; and content would be restricted to ‘social products’. On the input side, the local public health infrastructure (Goverment/NGOs) would decide what should go into the AidPods. This will vary from place to place and from season to season. Crucially, it is not up to Coca-Cola or ColaLife to say what goes in the AidPods. This needs to be determined by those with the long term responsibility for public health in a particular area. It would also be the local public health infrastructure (Goverment/NGOs) who decide what happens to the AidPods when they reach their destination. The contents might be put on the shelves of the Coca-Cola retailer and sold. This would obviously depend on the nature of the social products involved. 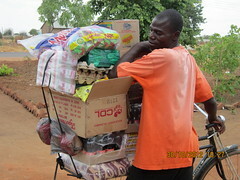 They may be collected by a community health worker and used to support a community health programme. 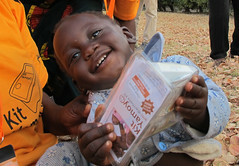 The AidPods might contain diarrhoea treatment kits for new mothers and be collected by traditional village midwives or the local clinic. I am sure that there are many other options but the local health experts will be the best people to decide. So, the roll-out of ColaLife, following successful trials, will empower the public health infrastructure in any particular locality. Not undermine it. And in remote areas it will provide a distribution mechanism that would be uneconomic to provide in any other way. Fortunately, this principle is compatible with the position Coca-Cola would want to take. They would not want to put themselves in a position where they could be accused of meddling in areas beyond their areas of expertise or of undermining local, often fragile, public health infrastructure. RT @colalife: ColaLife principle: local determination – read about it and why it's important: https://bit.ly/8ZP4ko | Great project folks.